This is a great foodie blog with unique and interesting recipes. I recently made the fennel risotto and it was out of this world! In fact I made it twice in one week! A website/blog with great tips on how to get organized! I consider myself fairly organized, but it seems that everything always gets messy again as soon as I clean it up. But as my husband says it all goes back to the 2nd law of thermodynamics which states: "all systems tend toward disorder and randomness." Ahh such is life! This is another food blog that has fun recipes. The woman who writes the blog has won a number of food contests. Recently I have made her chocolate chai snickerdoodles (I brought them to our iServe meeting last night and they were a huge hit)! I am also planning on making her chickpea and sun dried tomato hummus. I love hummus and I finally bought tahini! The recipes here are easy and yummy (although rather fattening....oh well it's not swim suit season yet). 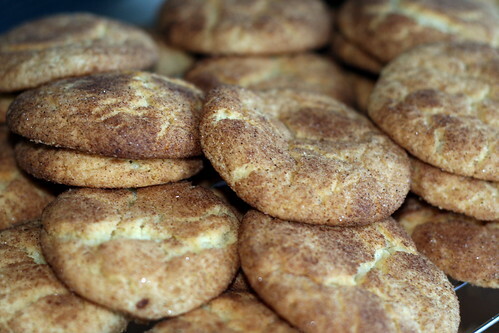 I have made her snickerdoodles and am planning on trying out her mac and cheese recipe tonight! Thank you to Sarah for mentioning this blog! This is a fun blog that shows what a food writer is currently working on for her cookbooks. She writes about the origin of spices, unique cuisine and food history. Every Sunday she has a fun feature which shows unique pantries from around the country. I am not from Texas nor have I ever been to Texas, however, I love country music, ribs, barbecue sauce and the Southern drawl. Ya'll this is a fun blog of a woman who lives in NYC, but who is a true blue Texan!! This is a book blog created by Steph, my college roomie! She is studying to be a librarian and she is one of my best friends. She also has a fun and fresh way of writing and making you smile and laugh!! The Silent Partner by Dina McGreevey-This was a rather blah read. Dina McGreevey's husband Jim was the former governor of New Jersey. He announced suddenly, near the end of his term, that he was gay. Dina writes about how this affected her life. Jim wrote his own book and Dina wrote this book to "set the record straight" (no pun intended). Escape by Carolyn Jessop-This is written by a woman who formally lived in a polygamist fundamentalist cult in Colorado City, Arizona. I couldn't believe this book was real the entire time I was reading it. It was quite shocking and disturbing...especially since people today are still living this kind of life! It Takes a Village by Hilary Rodham Clinton-Okay I know what you're thinking... no I will not vote for Hilary in 2008, but I did enjoy this book that she wrote back in 1996. It is a good read about how our country needs to take a more proactive role in caring for the physical, mental, spiritual and emotional needs of our children. I agree that it takes a plethora of people to care for our children's well being (family, friends, priests, community members, etc.). Eric Rex and the Monsters of Otherness-This is Kaza Kingsley's book 2 of the Eric Rex series. I just started it and I am really enjoying it! Kaza emailed me to let me know that she just finished book 3 and that should be out by the fall! You go Kaza! Eats, Shoots and Leaves: the zero tolerance approach to punctuation by Lynne Truss is a book I am halfway through reading. It does seem that in the age of the Internet m any of us have forgotten how to write and use proper punctuation(I apologize in advance for any punctuation errors this post contains). Sadly, children are not learning how to use proper English punctuation. This is a fun read that discusses how we can all help to promote and proclaim proper punctuation!! I have also been loving being a mom to Jacob. He's the love of my life and I can't wait to see him grow up and become a little man!! You're too sweet! Thanks for the shout-out! How did your chai cookies turn out?? Thanks for all the fun food blogs I can add to Google Reader. Jacob's the cuties little boy ever! Also - happy leap day!